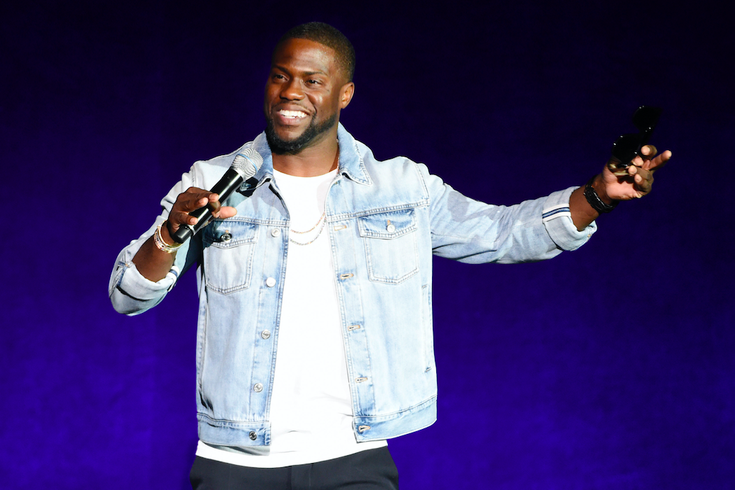 Kevin Hart presents at CinemaCon 2016 in Las Vegas on April 13. Kevin Hart is officially Philadelphia royalty, if he wasn't already. No joke, City Council passed a resolution on Thursday making July 6 "Kevin Hart Day" in Philadelphia. The date was chosen for the 37-year-old comedian's birthday. Earlier in the day, City Council tweeted that it was considering a resolution from Councilman-at-Large and minority whip David Oh to vote on Kevin Hart Day.
.@DavidOhPhilly submits resolution declaring 7/6/2017 as @KevinHart4real Day in the City of Philadelphia. And so it was passed, according to CBS3, which caught up with Oh for a word on his resolution. “Kevin Hart is a fantastic ambassador for the City of Philadelphia, and this is a simple way to show him gratitude,” Oh said. Hart grew up in North Philadelphia and attended George Washington High School before moving on to the Community College of Philadelphia and Temple University. He's been in the area lately (wisecracking as always) to shoot scenes with "Untouchable" co-star Bryan Cranston. Attempts to reach Councilman Oh for an explanation of what we're all supposed to do on Kevin Hart Day were not immediately returned. Hart, always active on Twitter, has yet to comment on the honor. His first book, "I Can't Make This Up: Life Lessons," is due out June 6 — one month before Kevin Hart Day in Philadelphia.